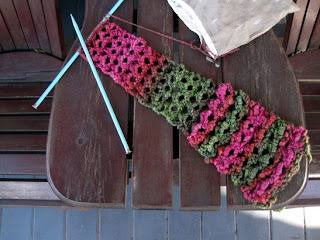 I'm making a determined effort now with a pair of socks, but earlier in the week I digressed with my current Crazy Cowl. This is a pattern I've been working out for handspun yarn - even the learner kind that goes from superchunky to thread in alarmingly short order. Well, maybe not that huge an extreme, so maybe not true learner handspun, but close. Based on my recollections on how the first one went though, I think the cowl could be okay in spite of the sudden shift in diameter. In case I didn't mention it, the first one went to my neighbour Monique. Monique had been keeping up with me about how Les was doing when he was so ill last year - do you know (no you don't because I never mentioned it at the time), he went into the hospital this week a year ago? - and six months later, the morning he died, I sent her an e-mail to let her know because there was not much else I could be doing at 6am. Well, around 10 Monique showed up at the door with cookies from my favourite bakery and a quiche so I wouldn't have to think about making lunch. Around 2 she dropped by again with a fruit tray from her mom, and sat on the porch with me a while. The next day, she invited me over for tea and just let me talk, and when the visitation finally began a few days later at the funeral home - more than an hour out of town incidentally - she showed up there too. This all happened during the Tour de Fleece so I had been spinning every morning in the sun on the porch, and had not long finished for the day when we found out Les was really going to go. All the yarn from that time is full of all the feelings you can imagine, but that particular yarn, the one I knit up for Monique and was working on the day before Les died and afterward, is full of gratitude for her specifically. Fortunately it was also spun a little further along in the Tour than the one shown above, and so it was a good deal more consistent. It even looks sort of normal. In fact as it turns out it looks really cool, in any of the approximately 14 ways she figured out to wear it within the first five minutes of my giving it to her. It's so versatile, I am being optimistic and thinking the pattern's going to be all right for any handspun even if the end result takes on bizarre shaping like the current one. b/decide what gauge and needle size to suggest as a standard. The latter is tricky since: hello, handspun! It varies so much. But all that handspinning I did over Christmas and blocked over New Year's is dry and ready to wind into cakes and knit up, and it's all way, way more consistent than this. More even than Monique's was. So with luck... end of the month. Stay tuned. No, We didn't know. And I am so sorry. But glad you have such a good friend.